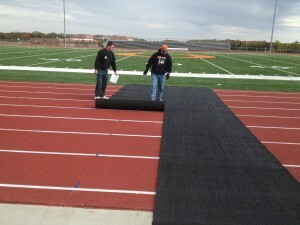 In October 2013, we shipped a few rolls of our slip-resistant matting to the good folks at Owensville High School. The school recently had a new rubber track installed and were looking for a way to preserve its condition. Because the track borders the football field, players are forced to walk across the track before, during and after games. High school administrators were concerned that over time, the player's cleats would tear up the surface and decrease the lifespan of the track. To help solve this issue, the school decided to spin out a few rolls of our slip-resistant matting onto the track, creating a pathway for football players to walk when entering and leaving the field. The best part about this solution is that it’s completely flexible. The matting can easily be rolled out and rolled back up, making it an extremely efficient option for the maintenance crew. To ensure our slip-resistant matting worked perfectly for the application, the PEM team paid a visit to the school, giving officials both installation and maintenance tips. If you would like to learn more about how our matting can be utilized to protect your rubber track, please contact us at 800.783.2358.